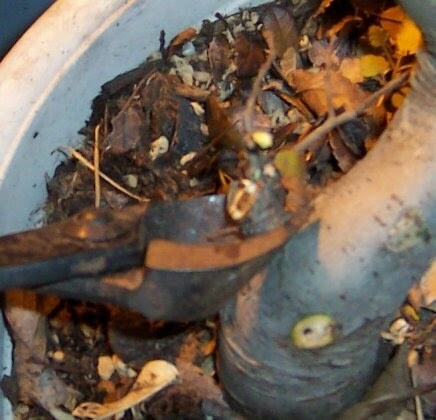 In this photo essay, I will prune an elm tree that I bought at Walmart for $10. 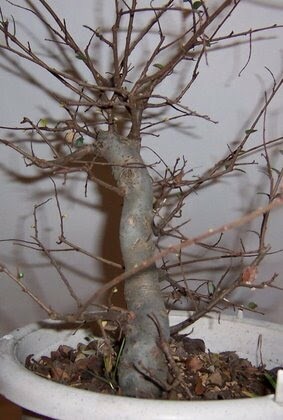 I tell you this reluctantly, because I've been finding great pre-bonsai material at Walmart for the past year. Most of the stuff they call bonsai is crap, but I have found a few elms and serissa that they would charge a fortune for at any bonsai shop. I purchased this tree in May of 2006. 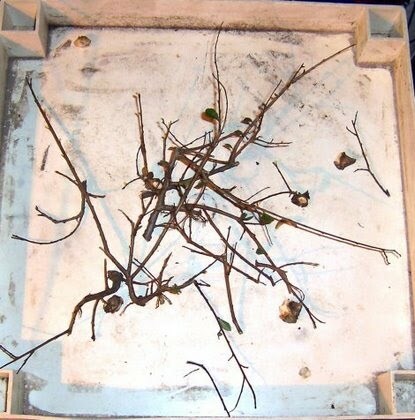 When you buy these trees, they will be in "potting mix" or dirt, and have decorative stones glued to the surface. These stones are perfect for keeping water from penetrating the soil and killing your tree. Pry the glued stones off. 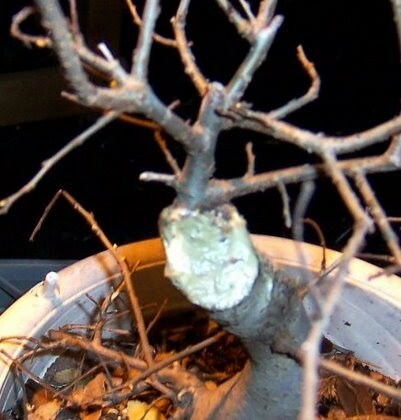 The first thing you must do is repot it into a larger pot with proper bonsai soil. 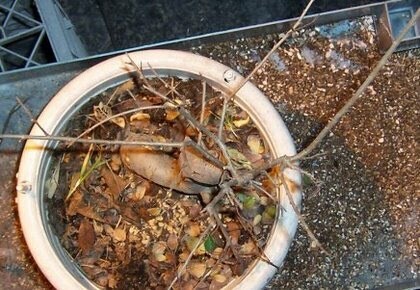 Use a pot that is 1 inch larger or so, but no more than 2-3 inches larger. Severe overpotting can cause root rot. 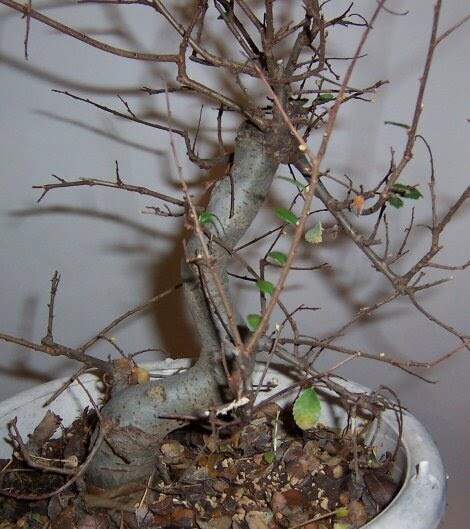 After repotting, keep the tree in a shady spot until it recovers, and gradually move it in to a sunnier area. I use the east side of my house, and my trees get 4-6 hours of morning sun, and shade during the hottest part of the day, from noon - 3pm. I left the tree out until December, and moved it to my winter storage area. 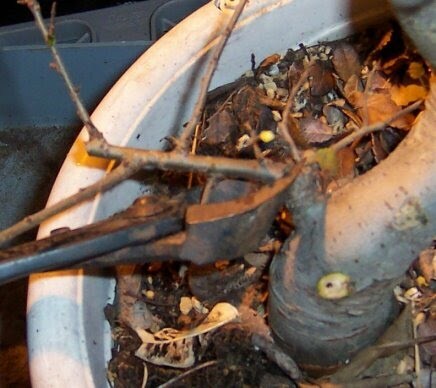 Today is March 4th, and I will prune this tree, and put it into my grow room where it will have a bright window and some supplemental light. It is better to do drastic pruning while the tree is dormant, because if you did this in summer, you would be cutting off valuable foliage. 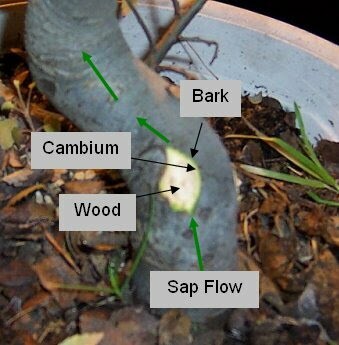 All of the energy of this tree is stored in the roots, presently, so you don't lose that valuable energy. 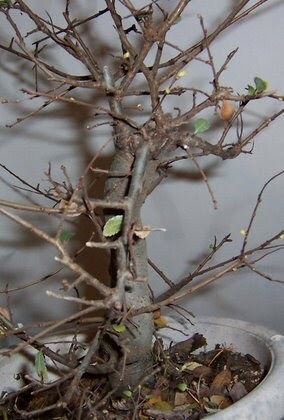 You should look for a "line" from the base of the tree to the eventual top. This will be your trunk. Everything else will be your branches. 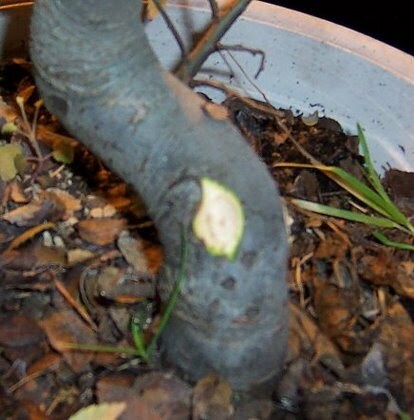 Anything that isn't trunk or branches gets cut off. Below are four pictures of the tree from four different sides. Click on the pictures for a larger version. See if you can pick out the line of the trunk and the front! The trunk on this tree has some great curves. Unfortunately, the curves are a bit two dimensional. If you look at photos 2 and 4, you'll see that the trunk looks straight from those angles. That definitely won't work. Picture 1 the trunk has a big mess on the top. There is a huge wound right there. That won't work. If you said picture 3, you are right! Here is a closeup shot of the top in that area. I'm going to cut most of this off, and just leave that one shoot in the middle to be the new top. 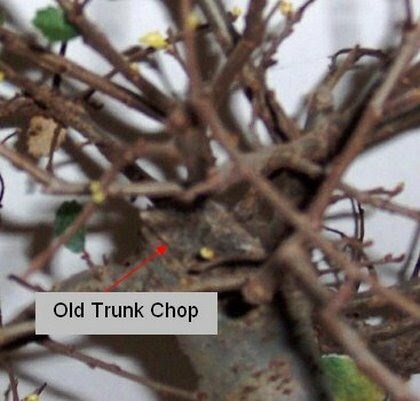 Lets take a look at the back where the old trunk chop is. I need to clean this up, and make a smooth transition from the small twig (seen above) and the huge trunk. The smoother this is, the better the wound will heal. 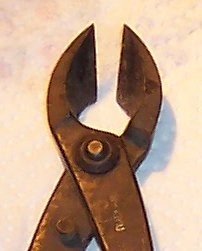 These pruners have a circular cutting edge and leave a spherical indent when used. 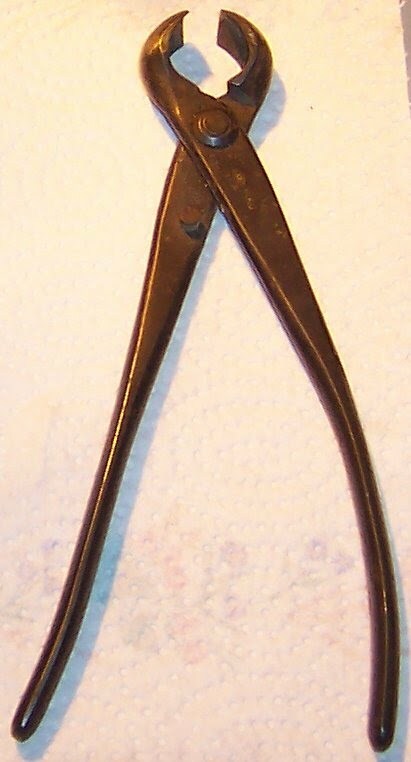 They are great for carving out wounds in the trunk. 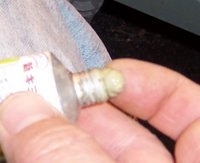 An indented wound heals flat. If you cut a wound flat, it will heal with an ugly bump. They cost $30. 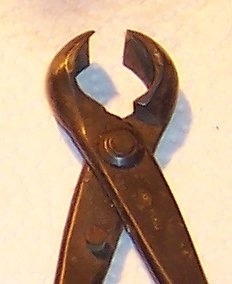 Here you can see the spherical knob cutters in action. I'll carve out this area and carefully leave just that one twig we picked out as the new top. That brown spot in the center of the cut is where the old trunk chop was. I'm going to use some Japanese cut paste, but Elmer's glue works. Cover the whole area. This will help it heal faster. Here is a closeup of the new top. I left the branch on the left because I think it will help heal the wound. It will be cut off later, after it fills in that small gap. Concave cutters are the main tool for removing branches up to 1/2". They have a flat cutting edge and leave an indented elongated wound. They are placed with the edge parallel to the trunk. These also cost $30. There is a branch I want to remove. I can't quite get to the trunk, so I will use two cuts. The first one, to remove the branch, and the second one to create the proper wound. Then place the cutters on the trunk parallel to the trunk, and cut off the nub that is left. This is the wound that is created. Notice the shape. As sap runs up the tree and back down, it will heal this wound very quickly. Now imagine if you cut the other way. The sap would run right into a flat spot, and stop. It would have to find a new route around, and the wound would heal much slower. 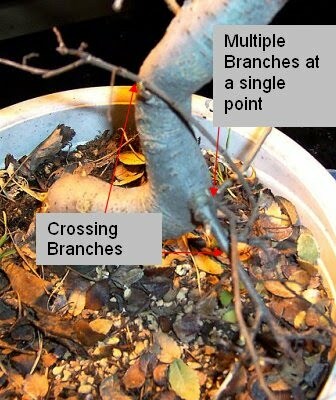 Here are some crossing branches, and multiple branches at a single attachment point. This will also lead to a huge bump. You can see where it has already started. Well, here it is. 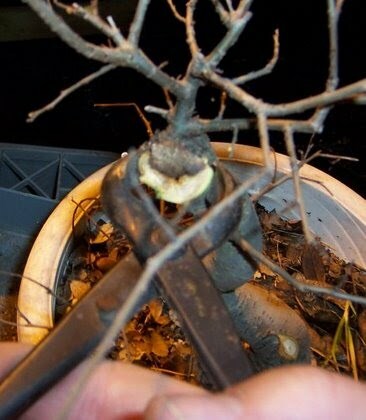 I've got my new top, I've got two branches. This tree will back bud, and I'll get a bunch more. No bar branches, no crossing branches, no overlapping branches, no branches on the inside of curves. Once the big wound heals up a bit, this tree will look sharp. A quick word about choosing branches. Most bonsai trees have 4 main branches and a top. The 4 main branches alternate, 1 on the right, 2 on the left, 3 on the right, 4 on the left, followed by the top. They can also go left, right, left, etc.. 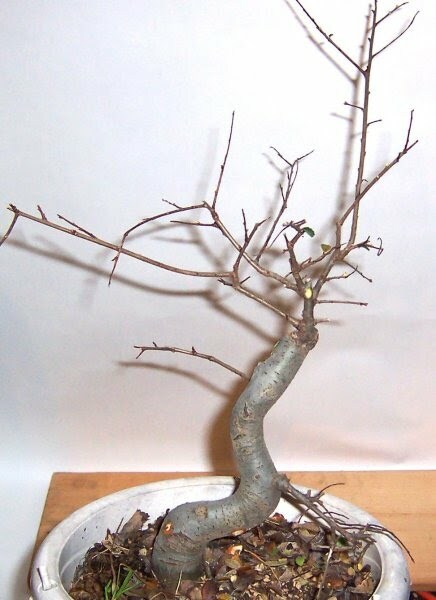 Branches look much better on the outside of a curve rather than the inside, if you can avoid it. Back branches should be placed periodically up the back of the tree. 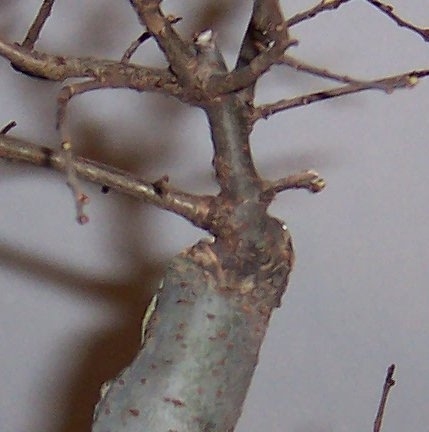 The first branch is the main branch and should be the thickest, largest, and longest. They are usually 1/3 of the way up the tree. 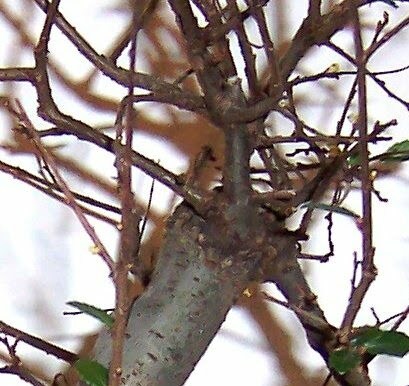 In the picture below, the branch on the right is our number 1 branch. The branch on the left is our number 2 branch. The rest have yet to develop. 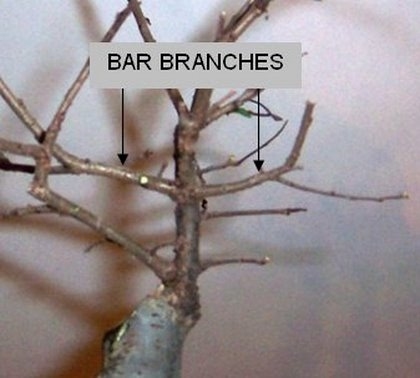 The #1 branch is in a good spot. I'd like a new branch at the number 2 spot. If one grows there, I'll cut off the existing one, otherwise, it will work. This is a good start. 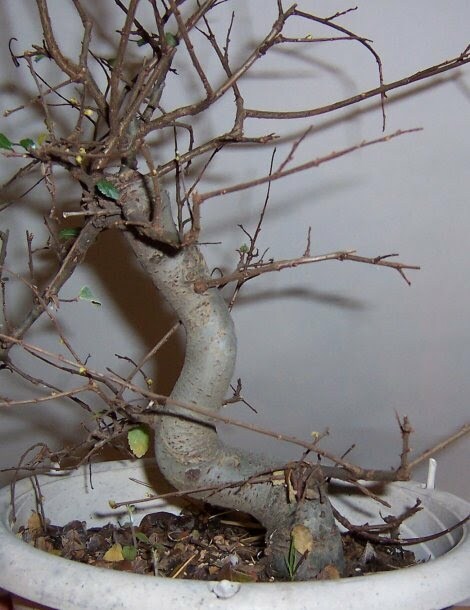 The branches on most pre-bonsai are in bad spots and need alot of work. From the top, you can see that none of the branches overlaps, and you have a nice radial pattern all the way around. Scraps for the compost pile.